Have you ever found yourself in a situation where you are super busy and someone asks you for some of your time and you say yes, when in fact, yes is the worst possible answer you could have given? If you are a yes to everything person then you are going to have to learn how to say no politely in English. 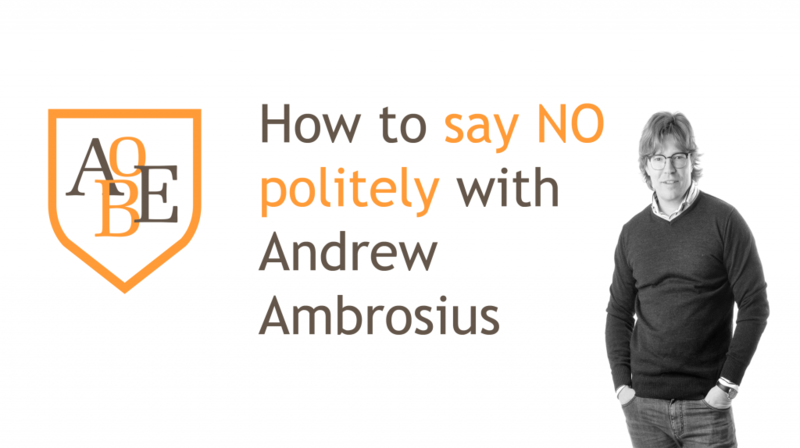 In today’s episode of the Art of Business English we are going to look at some techniques for saying no politely and some ways to identify when you are heading for a situation where you over commit yourself. Let’s start by looking at some ways to identify when you may be over committing yourself. A great place to start is by being organised and running a calendar week by week. If you go to the gym then make that part of your weekly routine, try and make the day fixed and block that time of in your schedule. I find that your calendar needs to have times allocated for things that may not necessarily be related to work. What do I mean by this? Well, if you need time away from work and the family, then you need to block that time of in your calendar. If you go to the gym then make that part of your weekly routine, try and make the day fixed and block that time off in your schedule. This will lead to you having more success at sticking to your gym routine. If you have to miss the gym on your gym day, then make a concerted effort to recover that gym time by rescheduling the time in your calendar. If you are embarrassed about your colleagues seeing your personal activities in your calendar, then you can either call the event something else, maybe business related, or you can make that event private. By having time blocked and already assigned to activities we “need” for leading a healthy and balanced life, then we suddenly have a more realistic picture of how much free time we actually have in our schedule. We can make a conscious decision based on the amount of free time we have left. There will always be an unknown, events and demands on your time will always pop-up, things that you didn’t expect to come along, suddenly present themselves and become a demand on your time. Another good tip to take into consideration is the time of year. This takes forward planning and thinking. For example, if you know that at the end of each quarter you are going to be very busy with closing the financial period, filling out reports and filing expenses etc. Then this needs to be reflected, this spike in work is something that can be foreseen, so as a result we must be aware not to book or accept more things than we can handle in this period of time. Additionally, there is the flip side of this example. There will always be an unknown, events and demands on your time will always pop-up, things that you didn’t expect to come along, suddenly present themselves and become a demand on your time. To cope with these situations, we should always have a small “buffer” in our schedule to ensure that we can absorb these events and not get overwhelmed. We need to be aware of time wasters and time-wasting activities. This is probably the thing that has the most impact on our time. Finally, before we move on to the next part of this episode, there is one final, and very important consideration. We need to be aware of time wasters and time-wasting activities. This is probably the thing that has the most impact on our time. To help my listeners understand this better I am going to share with you something I have learnt from an amazing and iconic book, “The 7 habits of highly effective people”. We need to consider the “Four Quadrants of Time Management”. 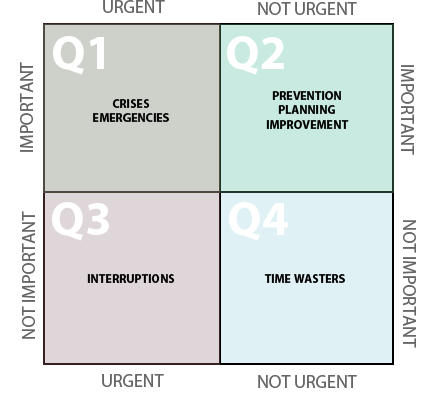 The four quadrants are governed by 4 main categories, urgent, not urgent, important, not important. They are then divided into 4 parts, Q1 is urgent and important, general crises and emergencies. Q2 is not urgent and important, prevention, planning and improvement. Q3 is not important and urgent, interruptions and Q4 is not important and not urgent. We should try and spend as much time as possible doing Q2 activities. For example, creative thinking and forward planning, exercise and healthy eating to avoid future health problems. Reading, learning and self-improvement. Most people mistakenly spend most of their time in Q3 because they confuse urgent things with important things. We must try and avoid Q3 and Q4. Most people mistakenly spend most of their time in Q3 because they confuse urgent things with important things. This is how we lead our life now; we are interrupted by phone calls and other people who feel that their issue is “important” and “urgent” and so you should react. Q3 is where we need to learn to say “NO!” to people. Q4 is the time wasters quadrant. This is where we need to learn to say “NO!” to ourselves. Time wasting activities include, but are not limited to, watching too much TV or Netflix binging, trivial busy work or “procrasterworking”, mindless web surfing and pointless reading and research. So, the only way to free up time for the things we should be doing in Q2 is by taking time from Q3 and Q4. As I mentioned before, Q4 requires self-discipline, while Q3 requires the art of saying NO to others. That is what I am going to help you with today. Let’s take a look then at how we can say no to people politely and avoid over committing ourselves. How can I say “no” politely? Now it is time to get down into the nuts and bolts of the linguistic part of taking back control of our time and saying NO when we should. Not the most elegant way to say no, so let’s take a look at some more polite ways to avoid committing and taking back more of your time. Thank you very much for asking, but I believe I have another engagement/meeting/dinner. I really appreciate you thinking of me, but I am fully booked in for the next month. Thanks for the invitation, but unfortunately, I am snowed under with work at the moment. That sounds awesome, I wish I could make it, but I have promised my wife/husband I will be home that weekend. Thanks for thinking of me, but I have a lot on my plate at the moment. I’m sorry to say, but I am going to have to pass up on this offer. I’m really sorry but I can’t, because… (if you use because as I have mentioned in previous episodes, you have more chance of people accepting your excuse, regardless of what the excuse is). Oh, that sounds lovely, let me discuss it with my partner and I will get back to you. That idea sounds fantastic! It’s just that I think I have something on that weekend. Regretfully, I will be away on business that week, can we schedule another time. What a lovely offer, can you call me in about 3 weeks. I will have more time then. I would love to help you, but I am so busy that I think I won’t be able to give you 100% of my best. I would love to come to your party, but I have already made plans. I’m afraid I won’t be able to help you that weekend, can we look for another time? I’m sorry I can’t help you with the project, but I could ask Chris if he has some free time. Now that you have the expressions, let’s break them down a bit. Firstly, you will see that I use a couple of techniques to soften the negativity. In many examples I thank the person for their invitation, or I thank them for thinking of me. I also say sorry; this is a great way to show the other person that you feel bad about not being able to help them and helps build empathy. Secondly, in some examples I approve of the idea by saying “that sounds awesome”, this technique expresses to the person that I actually like the idea, it is just that my other commitments or whatever excuse does not permit me to say yes. Finally, I use the words “I’m afraid” and “regretfully”, these expressions transmit to the listener that I would actually like to participate or say yes, but the situation is out of my control. Well that is all we have time for today, I hope you have enjoyed this episode. Let me know if you have any questions in the comments section below and feel free to share this with your friends. 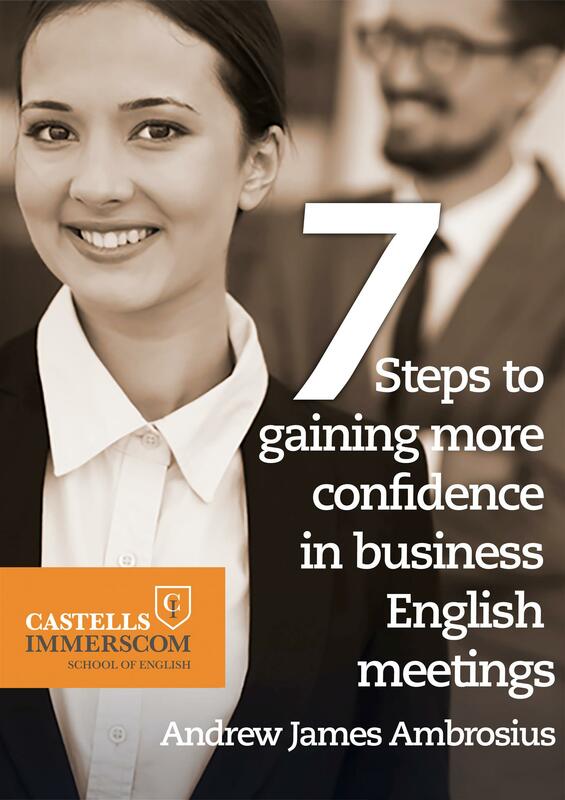 Discover the small steps that will improve your confidence in business English meetings. Our 7-step guide will help you to sell your products and services more confidently in your next meeting.